FRESNO, Calif. (KFSN) -- An Oakland A's fan thought it was safe to pick up a batting practice homerun ball hit by Aaron Judge during batting practice Thursday night. But, Judge promptly hit one to exactly the same spot nearly hitting the fan. According to the Major League Baseball website, it was the second of two straight moonshots to the Plaza Reserve level, otherwise known as Chad Pinder territory. 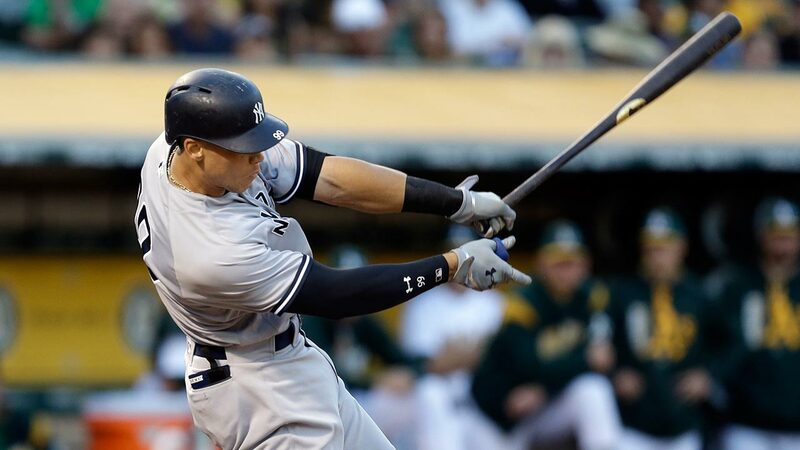 It's just not normal for players to hit balls that far to the same place, even in BP. Thursday night's game was a sort of homecoming for Judge who attended Fresno State. The Yankees selected Judge 32nd overall in the first round of the 2013 amateur draft. Judge is the second adopted son of physical education teachers Wayne and Patty Judge, who live in tiny Linden outside Stockton in Northern California's Central Valley. They adopted each boy at birth, six years apart.